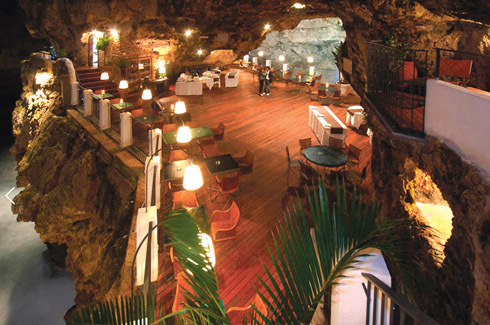 A terrace restaurant created inside a natural cave allowing for one of the world’s most unique dining experiences. Italy is home to the greatest number of UNESCO World Heritage Sites in the world. High art and monuments are to be found everywhere around the country. Its great cities of art history, like Rome, Venice and Florence are world famous and have been attracting visitors for centuries. Besides its art treasures, Italy also features beautiful coasts, alpine lakes and mountains. No wonder it is often nicknamed the Bel Paese (beautiful country). From charming roads to ancient monuments of significance, Italy is truly a beautiful country. 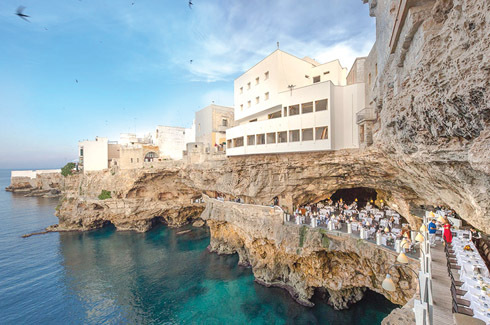 To add on to its long list of tourist attractions, Grotta Palazzese in the tiny town of Polignano a Mare in Bari might very well be one of the most beautiful restaurants in the world today. The Grotto Palazzese takes its name from the homonymous cave and the place that was once called “Grotta di Palazzo”. 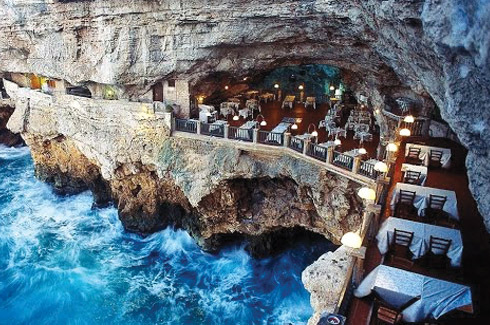 The hotel is carved out of a natural ‘grotto’ or a cave, that opens onto the sweeping emerald green Adriatic, and perhaps is the best spot from which one experiences this end-of-the-world vista at one of the restaurant tables with their sumptuous food options. Perched perfectly at the edge of a cliff, the restaurant gives its guests one of the world’s most unique dining experiences. 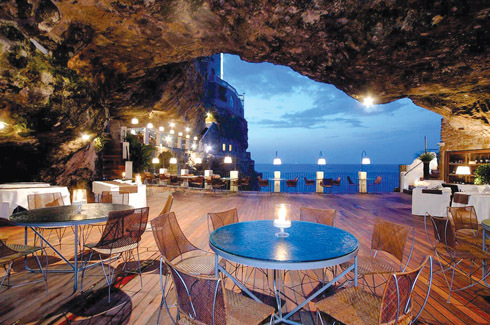 The restaurant is carved from the cliff’s limestone and sits 74 feet above sea level, bequeathing the diners with dramatic views of the ocean just beneath them. The blue of the sea and the sky contrasts with the mysterious atmospheres of the natural cavities. The colors of the day make the beauty of the coastal landscape shine, while those of the evening and at sunset, create unforgettable nuances in the charm and elegance of the restaurant lights. While the restaurant can easily be mistaken to being one among the newly established pit stops for people that love good food and aesthetics, the setting also provides a feast for the eyes of local nobility during grand banquets at the restaurant as far back as the 1700s. The Grotto Palazzese is open from May to September and is a must visit for anyone interested in viewing this innovative masterpiece made exotic with minimal frills.